This applesauce cake goes together quickly. The cake is moist and delicious and ever so yummy. A dollop of whipped cream or ice cream makes it irresistible! Thoroughly combine the ingredients in a bowl; the mixture should be crumbly. Set aside to top the cake batter before baking. Save any left over streusel mix for another use. On low-speed, add applesauce and vanilla. Measure flour and spices into a bowl. Add nuts and raisins to the flour, stir. Add flour mixture to the wet mixture. Mix until just combined. Grease and flour an 8 x 8 inch square cake pan. Pour batter into the cake pan. Top with Oatmeal Streusel Topping. Top with whipped cream or ice cream, serve warm. This entry was posted in Recipes, Southern Cooking, What every good cook should know and tagged applesauce, applesauce cake, applesauce muffins, baked oatmeal, Baking, coffee cakes, easy cake, oatmeal streusel. Bookmark the permalink. Oh my, that looks truly wonderful. This cake is going to my keeper pile. I love the combination of flavors. And that streusel topping will be very delicious! Thanks for sharing. You are quite welcome! I hope you enjoy it. What a delightful comforting cake – the kind of cake that makes you all warm and fuzzy. It is a comforting cake! I hope you try it. Thanks Mandy. Pingback: Applesauce Oatmeal Sweet Cake | What's On the Stove? Yes. It is essential for studying. I hope you keep you blog up, it is delightful. 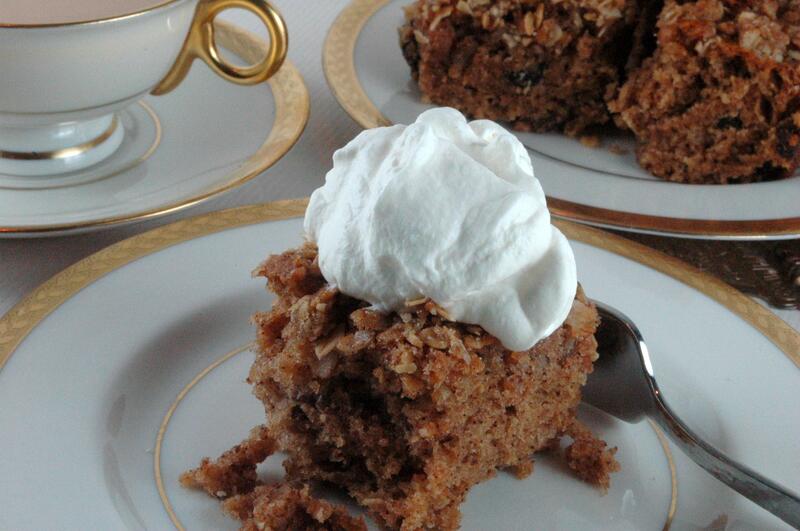 Pingback: Never Fail Applesauce Spice Cake | Cake Recipes Made Easy.